Today’s blog give away is brought to you by my forgetfulness. A $75 Little Knits gift certificate, a $50 Little Knits gift certificate, and two $20 Little Knits gift certificates. We hope these will help chase away the cold weather blues. To be included in the drawing for one of the above prizes all you have to do is to post a comment. You have till next Tuesday, November 9th, to tell us what you think would be the ideal prizes for a pattern/design contest. For this please assume that we will hold a pattern/design contest, select winners and award them prizes. What monetary or other type of award do you think would attract the designers (and you), to participate in such a competition? If you think a free trip to Seattle would be a good price just say so. Don’t be shy, please tell us what you think. Hope to see you at Live Stitch! PS. I did mean “prizes” not “prices.” This is what happens when you post at 1 AM and rely on spell check. On to the blog give away. Many thanks to Madeline Tosh for sponsoring this blog give away! They gave us two hanks of their new prototype yarn, Tosh Sport. I am holding a hank right now and I can tell you that Tosh Sport is soft, smooth and lofty. It would make beautiful accessories, garments and yes, socks. Tosh Sport is a 100% superwash merino that comes with 280 yards of yarn on each hank. The hanks seem to be around 70+ grams each. This is a guess as the labels are not marked and I don’t have a scale here. The color line is Well Water. If you would like to have these two hanks please tell us what you would like to see – more of – from Madeline Tosh. 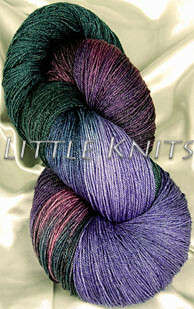 A new yarn, a new color, new fiber combinations, new yarn weights, anything you heart may desire. What would you like to see under the Madeline Tosh label? Please post a comment with your suggestion(s) and we will add your name to the pool from which we will select a name randomly. If your name is selected the yarn is yours. You have until Sunday August 1st, midnight to post a comment. Hope to see you here! Today’s blog giveaway is sponsored by Skacel and comes with a box full of great stuff. Thank you Skacel!!! As you may already know Skacel is the U.S. distributor of Addi needles and crochet hooks as well as Trekking, STEP, Fortissima, and Zauberball. Please let us know what specifically you like about Skacel products and more importantly, what other products or product improvements you would like to see from Skacel. Please don’t be shy and let us know all your thoughts. We will enter the names of all respondents into a pool from which we will select a name. 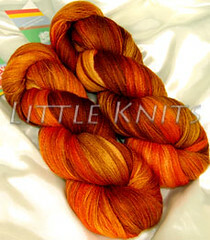 We will then randomly select a winner and annouce his/her name here and at Little Knits’ Ravelry group. You have till Saturday (July 10th), midnight to get us your responses. A collectors eddition Addi Turbo/Lace circular needles. These are 32” U.S. size 6 needles with an Addi Turbo tip at one end and Lace tip on the other end. We have got a winner! Thank you all very much for your comments and your feedback. It is greatly appreciated. We had a program select a random name from all the posts and Leilasgranny (Ravelry ID), won a beautiful hank of Peek a Boo Fly, a 65% superwash merino and 35% rayonized bamboo. 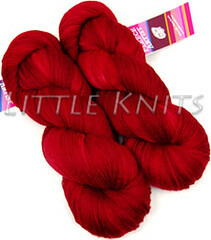 We like this yarn because it has a subtle silky sheen, a silky drape and it has a smooth beautiful hand. It comes in 8 ounce hanks with 1120 yards, which is enough for an average size garment, a large shawl or several accessories. Our first shipment of Peek a Boo Fly vanished quickly and we hope to get new colors in July. 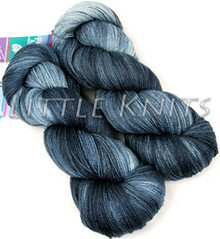 Leilasgranny is receiving the Cornflower color line, one of my favorite colors in this yarn line. In addition, the first poster gets a $10 gift certificate to Little Knits – you know who you are. 🙂 We figured being the 1st must count for something, right? 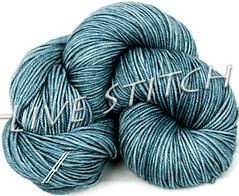 Watch for the next blog give-away, which we hope will be a continuous event at Live Stitch. As we wait for the summer to arrive in Seattle (what happened to Spring? ), I thought a blog giveaway was in order. All you have to do is to answer a question: please tell us the knitting and/or crochet product line that you would most like to see at Little Knits. This question is not limited to yarn lines. Your answer can be anything from a pattern line to bags, knitting needles/crochet hooks, simply put anything that you feel is important for your knitting/crochet needs. Just let us know your suggestions and we will enter your name into the pool from which we will pull a name . We will announce the winner here and at Little Knits’ Ravelry group. Before I forget, the winner will receive an 8 ounce hank of Fly Designs’ yarn with plenty of yardage for a shawl or a big stole or a light top that will keep your warm without being too toasty. This way you too can participate in the Fly Designs’ KAL, of course, only if you would like to. The name of the yarn we will be giving away, which is simply gorgeous, and the winner will be announced on Wednesday morning. You have until midnight of the 22nd to respond (June 22nd, 2010).